Thirty two classmates and fourteen spouses attended a blast from the past and retrieved long forgotten memories as Oconee High School Class of 1961 celebrated their 45th reunion at the Watkinsville, GA Community Center (July 15, 2006). …. 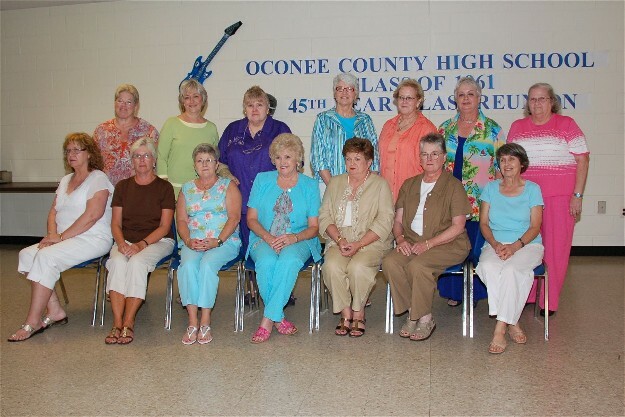 Oconee County High School Class of 1961 celebrates 45th reunion with a blast from the past! Joan Anderson Mann presented “Name That Tune” songs and Gwen Christopher Greenway presented trivia from the old school newspaper “Smoke Signal”.